Robert grew up in the foothills of Colorado and appreciates how human activities on land and sea affect marine life. He also sees how marine life in turn supports human wellbeing. Just as water flows from the mountains to the sea, Robert's studies in zoology and biology at Colorado State University and Arizona State University led him to study marine science at the University of Massachusetts, Dartmouth. His PhD research aims at describing the interactions between humans, marine species, and the ocean environment. 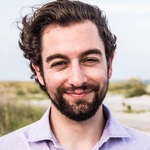 Robert uses quantitative and qualitative models to understand the impacts of human actions (through resource use and management) on protected and commercial species and the human communities that rely on them. He hopes to provide insight and perspective to ensure the continued sustainable management of living marine resources for the wellbeing of humans and marine animal populations, alike. Although Robert's research covers many species from pelagic bacteria, krill, scallops, herring, and sea stars, to cod, sea lions, orcas, and of course humans, his favorite marine animal is the sea dragon. He enjoys his collaborations with multiple universities and government agencies and is dedicated to outreach and education of the next generation of marine ecologists. In his free time, Robert loves sharing his habitat with friends through hiking, biking, cooking, and road trips. Please get these tags out there on some whales! We really need as much (cheap) data as we can get! Thanks Famarama, you've helped us to do our part!